The Deadwood movie is very much alive and well, chugging along the television movie tracks at a steady pace. And, according to lead actor Ian McShane, the gap between the original HBO series' conclusion in 2006 and the Deadwood film's premiere this spring will be more than worth the 13-year wait. McShane, who portrayed Gem Saloon proprietor Al Swearengen on the David Milch-created Deadwood series and reprises his role for the made-for-TV film, spoke with Deadline during the Television Critics Association winter press tour on Tuesday and opened up about what fans can expect to see in the upcoming chapter of the Deadwood canon. For starters, McShane detailed that Deadwood the movie will pick up a over decade after Deadwood the show left off, chronicling how his character and others like Timothy Olyphant's former-Montana-marshal-turned-Deadwood-sheriff Seth Bullock, Molly Parker's wealthy socialite who moved from New York to the frontier Alma Garrett, John Hawkes' levelheaded Austrian transplant Solomon "Sol" Star, Paula Malcomson's prostitute Trixie, and Gerald McRaney's gold-hungry son of a mining magnate George Hurst have changed over time. The film honors South Dakota becoming the 40th state to join the Union, and sees Hearst returning to Deadwood in attempts to exact a new-fangled plan that he can hardly get off the ground. "Deadwood is celebrating South Dakota as a state, and Hearst has come back and Alma has come back in town, so you have all the main characters converging and how they changed in ten years," said McShane, who took home a Golden Globe Award for his performance as Al Swearengen on Deadwood in 2005. "Now Hearst wants to put telegraphs in town, which isn't going too well. Al has had a little bit too much of that over the years. There's a surprise for Trixie and Star." The actor then mentioned that Milch, who wrote the Deadwood film, had the script finished before shooting began. This was quite a different approach compared to the methods Milch employed when overseeing the series; Deadline notes that Milch often did script re-writes "on the fly" just before actors were about to hop in front of the camera to shoot a scene for an episode. As McShane explained, "This script was done, but nothing like we did before because it's a two-hour movie, it's a whole different thing [next] to doing an episodic." Anyone worried that the Deadwood movie might not go out on a bang, we have the salve to soothe your soul: McShane teased that the film's conclusion will send your mind swirling, and allows room for a sequel to happen should HBO deem one worthy. "It ends leaving you wondering," the actor shared. "If it makes $115 million, HBO will somehow find a way to do another one." These remarks echo what Deadwood movie producer Carolyn Strauss has said about the film's tone and story. She told Entertainment Weekly in a December 2018 sit-down, "It's about the passage of time. The toll of time on people. It's mellowed some people and hardened others. And it's about the town's maturing and becoming part of the Union and what that event sets in motion, in a very personal way for the people that it brings in town and what ensues. The toll of time has not just struck Deadwood and the characters but all the people making it as well … it was really profound. Actors were crying at the table read — not necessarily from the script but the emotion of being back and doing something we all loved doing so much. You normally have a great experience and then it's over. You don't normally get the chance to do this in life. It was kind of a gift." The Deadwood film has been in development for quite some time now — since June 2006, to be exact. When HBO pulled the plug on Deadwood, Milch came to an agreement with the cabler to create two television movies that would run for roughly two hours each, would wrap up the dangling storylines, and would give the characters a proper send-off. HBO agreed, not budging on its decision not to grant Deadwood a fourth season. A year and a month later, in July of 2007, HBO brass changed their tune slightly, chalking up the probability of the pair of Deadwood films actually coming to fruition at a "50-50" — despite HBO's then-president of programming Michael Lombardo stating at the time that the projects were "certainly on our books as something we're still interested in." In October of that year, McShane admitted defeat when he told MovieFone that the Deadwood films were dead in the water: "They're dismantling the ranch and taking the stuff out. That ship is gonna sail. Bonsoir, Deadwood … You feel cheated? Imagine how I feel! We all do. We all do. It was one of those one-off jobs that you do which has got an extraordinary creative brain behind it, and it kept getting better, and the actors were great. It was a fabulous place to be and work … It was an extraordinary time. But everything has to come to an end, babe." The projects came to a stand-still thereafter, and not much chatter circulated through Hollywood until August of 2015, when HBO confirmed that "very preliminary discussions" with Milch about a Deadwood movie had picked up again. Milch got to scriptin' the first Deadwood film in early 2016, and in April of 2017, McShane cautiously announced that Milch handed in the story to HBO executives. The actor did note at the time that fans should "blame" HBO, not Milch, if the project never materialized into a finished product. However, everything was on the up and up from there on out, making McShane's words of wariness obsolete. By the time July 2018 rolled around, HBO was all for a Deadwood movie, giving Milch the go-ahead and hiring Daniel Minahan, who worked on the series, to direct. Filming began in the fall of 2018, with "everyone from the main cast who still draws air, with the exception of Silas Adams [Titus Welliver]" returning to bring back to life the characters they portrayed on the show. 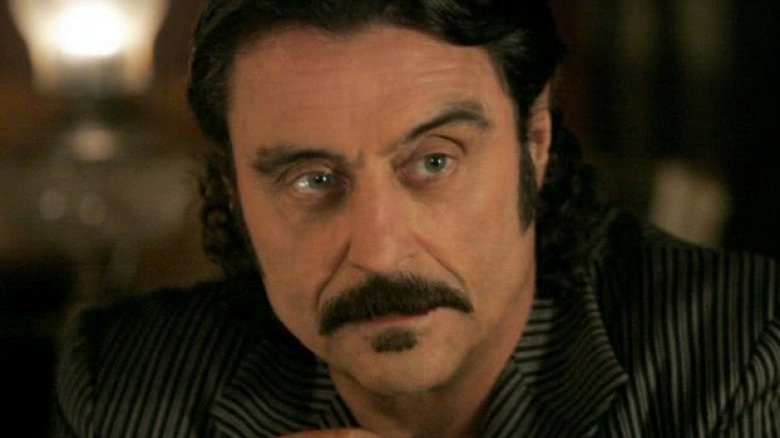 It's fantastic to hear McShane speak so positively about the Deadwood movie after knowing the kind of hell the project has been through and the kind of disappointment the Deadwood cast has faced in trying to get the film made. Fans can look forward to finally seeing the Deadwood movie on HBO sometime this spring.